Meateasy is achingly trendy. Judging from the midweek night when I was there with my entourage, the average customer probably lives, or wants to live, in Hoxton and has uneven facial hair and eclectically ostentatious clothing. Drinks are served in jam jars and the chairs are an odd mish-mash of different styles, with no two exactly the same. Lighting is so dim, it’s impossible to read the fake newsprint that serves as the wallpaper. The place doesn’t have a phone number, but does have a Twitter feed – even all the signage includes a hashtag in Meateasy’s name, but I refuse to refer to it as #meateasy in this review. As its name suggests, Meateasy focuses on burgers. Originally a roving burger van, the proprietors had their van stolen and have promptly set up shop above The Goldsmiths Tavern in New Cross. Directions are provided on the (barely legible) website, but finding the entrance involves going round the back of the pub in a side alley and up a fire escape, which no doubt makes the trendy hipsters pat themselves on the back for being literate. The space above the Tavern is only Meateasy’s temporary home – this is a pop up eatery and the proprietors only plan on sticking around until mid-March. With its emphasis on burgers, it’d be tempting to dismiss Meateasy as just another wannabe cashing in on the fading fad for posh but inexpensive burgers, but that would be a mistake. I indulged in a Dead Hippy, a two-pattie burger that bears a passing resemblance to a Big Mac. 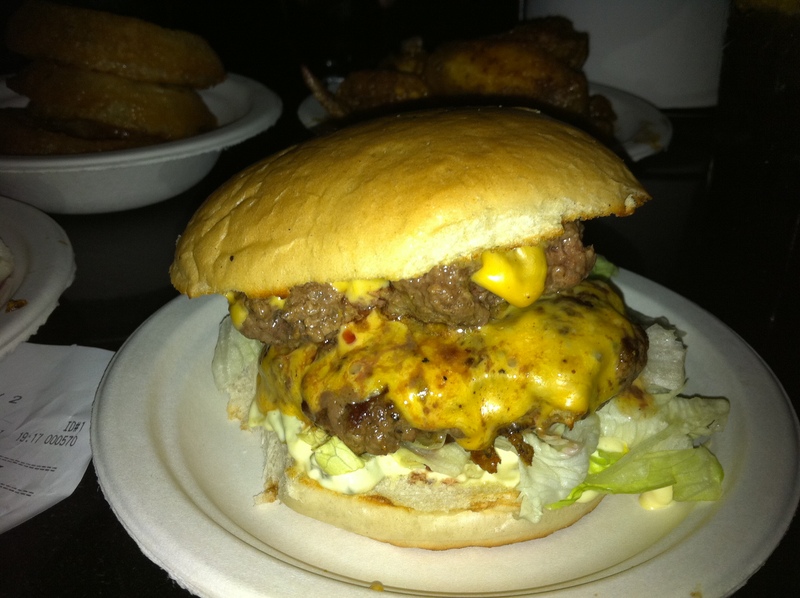 This shouldn’t put you off though – the patties were delightfully succulent and juicy without being too greasy. They were evenly cooked to perfection, medium/medium rareish. The sourdough buns were surprising bland, but they did their job of holding the burger together without becoming soggy, even with the dollop of burger sauce already present and an extra squirt of ketchup. The shreds of lettuce and melting slab of heavily processed American cheese were an afterthought. The two-pattie Dead Hippy. No hippies were harmed in the making of this burger. There’s a wide range of side dishes available. Sadly the onion rings, although actually made out of whole sliced rings of onion rather than reconstituted mash, were far too oily and the engorged batter looked like it’d been inflated with an extra helping of grease. The Euro Hedgie reckons they were deep fried for too long in oil that was far too hot. The fries thankfully didn’t suffer from this problem, but they were weedy french fries rather than proper, chunky chips. 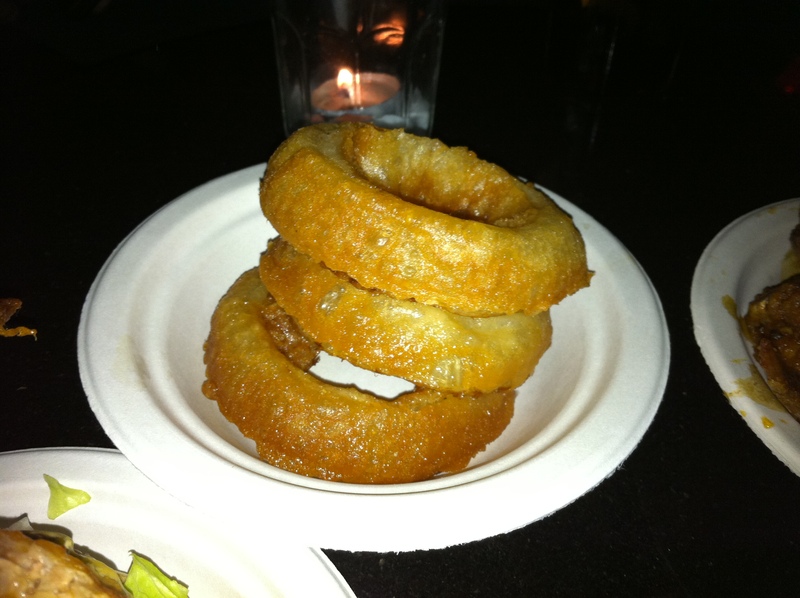 You get around half-a-dozen onion rings per serving, but Wicket couldn’t control himself before I could snap this photo. The Jolly Giant was mightily impressed with the buffalo wings declaring them ‘the best’ he’d ever tasted. Although I wouldn’t go that far, they did have a slightly sweet, slightly tangy flavour that was certainly moreishly pleasing without being too greasy or too dry. The Lensman wolfed down his giant plate of macaroni and cheese so quickly, that when asked for his opinion of a dish, he could only muster a satiated sigh. 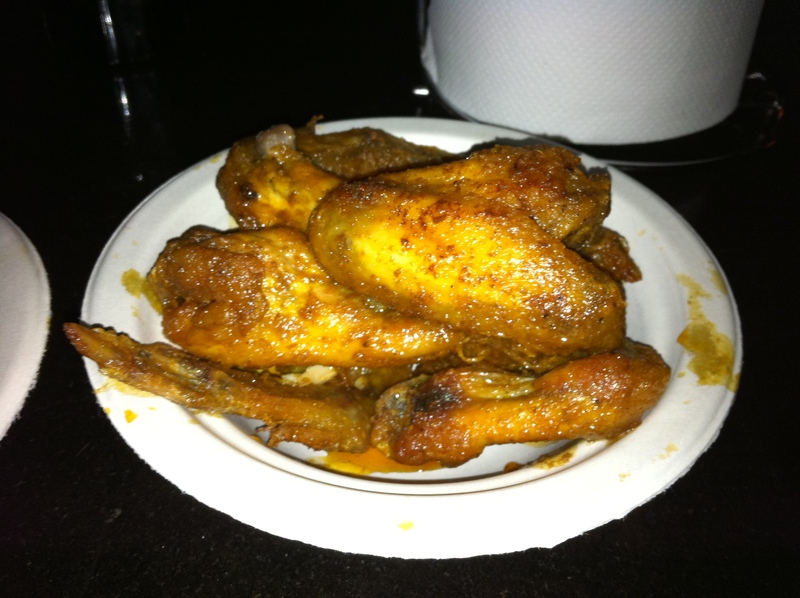 Buffalo wings at Meateasy. Yes, those are plastic/paper plates. The slightly cramped environment of Meateasy’s dining space means the ordering system is slightly out of the ordinary. Instead of traditional table service, you take a numbered ticket (in the form of a clothes peg, naturally) and wait until you number is called before placing your order with the delightfully friendly waitress. The menu is written on an enormous wall-mounted chalkboard, but the menu only consists of a dozen items at most, so picking your burger and sides shouldn’t take long. Once ready, a waiter brings the food to your table, although you’ll have to pay attention as they wander the aisles calling your name/ticket number. It sounds chaotic, but it works reasonably well and, as the Jolly Giant points out, is probably the only workable system given the limited space and staff. The ticket system does make Meateasy feel vaguely like a GP’s waiting room set up in a squatter’s flat, but the bar at the back of the room prevents the atmosphere from resembling that of a grungy Argos collection point. Soft drinks are reasonably priced – a 330ml bottle of Coke costs £1. A bottle of Meantime, the only beer in stock the night we went, costs £3 which isn’t bad. A pricier selection of cocktails is available too. Getting a table can be tricky though – reservations aren’t taken and tables were scarce even though we arrived a mere 30 minutes after the 18.00 opening time. It’s clearly not a place to linger though, as patrons come and go fairly quickly so you shouldn’t be left standing for long. Meateasy has already garnered glowing reviews in its short life, but our approval isn’t quite as unconditional. Although the burger patties are clearly a labour of love, I’m not quite as won over due to the inconsistent quality of the side dishes and you’ll either love or hate the odd ordering system and the quixotic decor. Nonetheless, at £14 for a quality burger, two voluminous side dishes and a drink, Meateasy just earns a 4 star rating for good value meat alone. Go now, while you still can. I wasn’t as impressed by #Meateasy as I hoped after the ravings of a friend who’d been addicted to the Meatwagon. The onion rings were truly hateful, the frozen chips were from giant sacks hastily removed from the dining room when we arrived, and the burger buns, while crisp, were inferior to the addictive brioche-dough of McDonald’s finest. The meat was good but not amazing, and I felt, to some extent, it was the size and freshness of the burgers that had originally attracted acclaim; alongside the extended wait that is, which always improves your experience.